It wasn’t the best book in the series, not by a long shot, but it was a satisfying ending to the series. The final climax occurred in a way that very few people could have seen coming, and the tying-up-but-not-completely-closing of over 20 years of sub-plots was done very well. As I said, for nearly a week, I kept finding myself stopping what I was doing, struck with the realisation that various characters were dead. Not that I wouldn’t find out what had happened to those that survived, because, well, they were still alive and I needn’t worry. It’s weird. This is all the more impressive, considering that while it would ordinarily be considered a testament to the author, in this instance, it was not the original author who completed the series. After Robert Jordan died in 2007, his widow and editor chose fantasy author Brandon Sanderson to finish the series. I’m pretty much in awe of Sanderson, as not only does he write phenomenal Fantasy books, he also writes them with an astonishing speed. Seriously, check out his output! So for him to have completed a trilogy of this length, with so many people invested in it, while still writing his own fiction, it’s an impressive thing. There’s been a lot of controversy about the publication; mostly in that the eBook version will not be published until the end of April. The stated reason is that Harriet, Jordan’s wife, (who’s 82 years old btw, and thus can not necessarily be expected to have grasped the eBook zeitgeist), wants the book to top the NYT Bestsellers list, in tribute to her late husband. I’m not entirely sure how I feel about this, because on the one hand, I do love my Kindle, but on the other, if we’re talking about convenience, paperbacks are more convenient than hardback, and they never come out at the same time. What I know I don’t agree with is the hundreds of people who have been review-bombing the book on Amazon because of this, with no actual bearing for the quality of book. Or the people who, within a couple of days of the publication, had scanned the book and uploaded it online. And most especially not the people who have posted some horrific abuse of Harriet and her husband’s memory online. As I said before, if you’ve not already read the Wheel of Time series, you’re not going to pick up the final, 14th installment, but for everyone that gave up on the series before now; it’s worth picking it back up, just for this ending! So, this time it’s something a little different. Part of the reason that posts have been a bit sparse lately is that most of the time I’d ordinarily have spent reading, I’ve actually been listening to audiobooks. 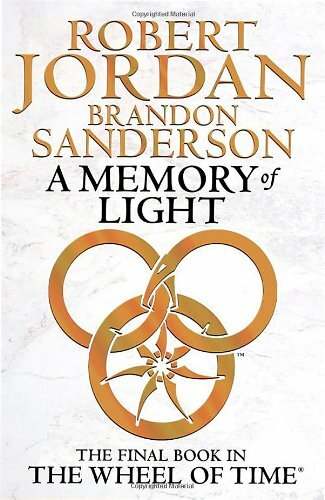 Although I’d read the first 13 books in the series, in preparation for the publication of A Memory of Light, the 14th and final book in the epic fantasy Wheel of Time series, and to pass the time during my commute to university, I started to listen to the audiobooks. That was in November 2010, and by the time the last book was published on this past Tuesday, I’d only managed to make it up to book 10 (I had not been listening constantly by the way). What happened next is a story for another day. As I said, this post is going to be a little different, as rather than reviewing the books as such, I’m going to be talking about them as audiobooks, and the medium in general. (That said, the ratings above do reflect the novels). I’ve always been a fan of audiobooks. I was older than I care to admit before I stopped falling asleep to the sound of a good story, and had done for as long as I can remember (and when I was younger, usually after already having read a substantial amount of a book before turning the light out). It’s a good way to consume novels, and I’ve noticed while listening to the Wheel of Time, I often pick up on things that I hadn’t done previously. Not so much in terms of plot, but more subtle things, such as distinctive character voices and (unfortunately), overly florid or repetitive descriptions. But then, there is an issue unique to the medium; that of abridgment. You’d never go to a bookshop, look at a book, and think “That looks too long but I still want to read it, I wish there was a shorter version”. Well, maybe some people would, but no one would ever pander to your wishes. I suppose it made sense in the era of audio cassettes, and I suppose even CDs, because you’d end up with situations like this, but to still see abridged books being sold in digital format is baffling to me. It’s not all bad. Tony Robinson (of Blackadder fame) has narrated all of Terry Pratchett’s back catalogue, and they’re fantastic, but it’s not quite the same. You still get the essence of the story, but because, generally speaking, plot is not removed, it’s all of the extra bits that make the writing worth reading. It baffles me. This also tangentially moves me on to the issues of the narration. There are, as I’ve noticed, three main ways this can be approached. The standard version of a single narrator reading the whole text, then two narrators alternating depending on various conditions, and finally, full on dramatisation. All have their pros and cons, and I’ve heard good examples of each of them. Possibly my favourite example is the His Dark Materials trilogy, in which the third person narrator is the author, while all the character voices are provided by train theatrical actors. It’s fairly epic. The Wheel of Time books have two narrators, one male, one female, who alternate based on the gender of the POV character. The biggest pitfall to me is their accents. Though both Michael Kramer and Kate Reading are good at providing distinct character voices, the accents underlining both of their voices is American. Even though there is no reason (despite Hollywood) to assume that the inhabitants of a fantasy world would speak with British accents, that is always going to be what I hear in my head, unless otherwise specified. (The American narrations of Harry Potter however, is just plain damn weird). So that was a problem when I first started listening to it, but about halfway through the first book, I managed to get over it. There is also the problem of pronunciation. There can be a degree of forgiveness for variations in the way the two narrators say made-up words, but on some of the more complicated character names (The most prominent being, for the sake of example, Moghedien and Moiraine) the narrators do not pronounce them the same way twice in a row, let alone the same as their counterpart. It’s irksome enough that they don’t pronounce these the same way I had, but this is incredibly infuriating, and would be highly unhelpful if you didn’t already know who they were talking about. The only other complaint I have with the narration of these books, is that sometimes, the narrators just straight up make mistakes. It’s forgivable. Each book is in excess of 250,000 words, but to suddenly hear a character who is a thousand miles away from the action show up to deliver a single line and promptly disappear again, is a little jarring… But this happens so rarely that it’s not really worth holding it against them. The series as a whole is, in addition to being an amazing piece of fantasy literature (and despite what many naysayers will claim, worth putting the effort in to get past the weightier books), great fun to listen to in spite of the issues I’ve spoken of. I could probably rhapsodise for another thousand words on the pros and cons of audiobooks, and perhaps I may yet before the year is out, but I think I’ve said enough, for now.